Nordic Ware "Holiday" Cookie Stamps (set of 3) "BRAND NEW" Made in AMERICA !! Coconut Pyramid Maker. Condition is New. Dispatched with Royal Mail 2nd Class Large Letter. Simple to use and easy to clean. Material: Food grade silicone BPA free PP. Feature: Brand new and high quality Material: Plastic Color:As The Picture Size: 4.3*2.7cm Package Includes:2Pcs Conversion: 1 inch = 2.54cm or 1mm = 0.0393inch, 1cm = 10mm. 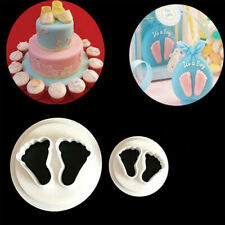 It also provides four nozzles to make biscuit machine and make decorative cake by hand! Insert a shaped disc, fill the barrel with room-temperature dough, and tighten the plunger rod. 1x Set of Biscuit Maker Cutter. Oval : 2.5". Item may get delay if you are not around or due to small letter box (the item might not fit to your letter box). Title : Wooden Cookie Stamp Set. Give your bakes the ultimate stamp of approval with this incredible set. Due to the high number of orders we receive, we WILL NOT see any notes you add to your order. Gebäckpresse aus Edelstahl. 1 x Gepäckpresse. mit 13 Scheiben und 8 Aufsätzen. 13 verschiedene Motivscheiben. Material: Edelstahl, Aluminium, Kunststoff. 8 Spritzaufsätze. 13x Motivscheibe. LED Lichterkette mit Batterie - 10, 20, 30 oder 50 LEDs - warmweiß oder kaltweißEUR 1,99-4,99. Condition is Used. Red tin 50's diner style clock. 2 red cast iron trivets pan stands. 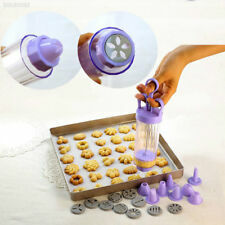 Wear Ever Super Shooter 70001Electric Cookie Press Camdy Maker . Condition is Used. Shipped with USPS Priority Mail. Works perfectly..comes with 8 discs. Super shooter is complete and works great. There are 12 different designs. They have never been used. Has been well cared for. Our goals are to provide you with The box is a bit worn out. Vintage Mirro Cooky-Pastry Press 358-AM. Condition is Used. What you see is exactly what you’re going to get. It’s in great shape due to its age. The box isn’t perfect it does show yellowing, box has normal wear but is still very nice. All the pieces and the book are in really good shape. It has 12 discs and 3 tips the dispenser and the instructional booklet. Comes from a smoke free home. Free Shipping. NEW IN BOX Cookie Press Set OXO Good Grips 13 Piece Non Slip Base Multiple Disk Designs. Pampered Chef cookie press #1525. new in the original box - box has a smudge on it. Also includes recipe book and instructions. 16 different discs for all occasions. of Bible verses. Clay Cookie Press From Shaker Hearth, hand painted handle in a shape of Christmas Tree. Never out of the box, but the plastic box squashed. It comes with a Mini booklet with recepies. Marcato Biscuits, Cookie Press, W/20 discs, made in Italy. was used once. In very good condition! Shipped with USPS Priority Mail. Pre owned lightly used condition. Wilton Simple Success Cookie Press Use this classic cookie press to make uniform spritz cookie shapes. Make fast and easy uniform spritz cookies for a crowd. Cupcake Cases. Air Art Cupcake Stencils. 12 Fit Right cookie disc shapes. Vintage Mirro Cooky And Pastry Press With 12 Discs 3 Tips & Recipe Booklet. Condition is Used. Shipped with USPS Priority Mail. This cookie press is self storing. Free shipping is for the mainland USA. Thank you !! Premium Garnierspritze/Gebäckpresse Set bestehend aus Glasdeckel für Pfannen und Töpfe von Ø 8 cm bis Ø 40 cm! - komplett Edelstahl rostfrei. - stabile Kunststoffboxen. - 1 stabile Profi Presse aus rostfreiem Edelstahl. This is a crank style press and the crank and screw are in like new condition. All cookie shape discs and all parts are present and in great condition. The rarely found cookie recipe booklet is present and included. Very Cute Cookie Press, Several Shapes. Box is showing signs of wear etc due to age, storing and handling. Estate find, sold as is! Heavy cast keepsake stamps imprint cookies with bee, flower and honeycomb designs. Trending and timeless. Simple, yet sensational. Cast Aluminum with Wooden Handles Interior Dimensions: 3 different styles in 3" round cookies Exterior Dimensions: 3.88"L x 10.13"W x 3.38"H 5-Year Warranty and Made in the USA. Complete set. box wear as pictured but overall good shape! (READY TO USE FOR COOKIES. I TRY AND EXPLAIN. I AM VERY EASY TO WORK WITH :). No recipe book, but recipes are readily available online. Model 82505. Sears Fun Gun Electric Cookie and Canape Press. Includes 9 different cookie discs. Complete in original box and includes idea book / instruction manual. Gebäckpresse Set bestehend aus - 1 stabile Gebäckpresse aus Kunststoff & Edelstahl. Glasdeckel für Pfannen und Töpfe von Ø 8 cm bis Ø 40 cm! - stabile Kunststoffboxen. - 6 Spritzaufsätze aus Edelstahl (Länge: ca. 3 cm). If you wish your item to be. They are howeverSOLD AS SEEN. Our rotating press is easier to use than the typical ratchet style. THE PAMPERED CHEF COOKIE PRESS #1526. Like new original box. This does not affect the performance of the pieces. To maintain luster, hand wash.
Also included is the original 20 page recipe booklet and a small 16 page booklet that displays Mirro products. Good original condition. The 20 pg. recipe booklet has a small edge tear and the box has a couple tears and other surface wear. Very Hard To Find!, and are in excellent condition. There are no markings.I've only seen 1 other, which is in the Basque Museum and Cultural Center, in Boise, Idaho. The item looks like it's most likely from the 80s to early 90s. The little shape pieces are still wrapped in a small bag. Beautiful cookie press by Mirro. Excellent used condition. Unit will ship without box to save on shipping.